For more than 25 years, TMC has had the pleasure of working with countless organizations, head groundskeepers and maintenance crews all across Texas in helping to build premium baseball and softball fields. Head Groundskeepers Eric Ferland and Karsten Blackwelder are two professionals that ensure their high profile baseball fields receive the necessary dedication and care. TMC asked Eric and Karsten to take part in a Q&A on maintaining professional, premium baseball infields. In this two part Q&A (as with every post here on the TMC Sports Turf Blog), we hope to educate and inform anyone responsible for maintaining baseball infields by sharing some of the experience these head groundskeepers have garnered through years of professional learning and service. "Usually two days out from an upcoming home stand we begin to apply the water. The goal is “refill” the skinned area profile with water by flooding it out several times each day. Once the home stand begins we then start our game day routine. Post-game we nail drag the infield skin to remove cleat marks, rake chunks back from the grass surrounding the entire skinned area, and steel mat drag/rake the skinned area smooth. Before we leave for the night the skin is flooded again (weather permitting)." 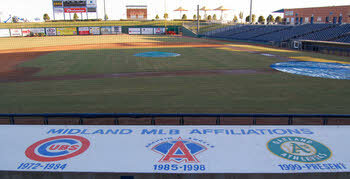 "The following day we then pack out our game mound and plate, drag the infield skin if we drove any equipment on it such as a mower, and then we apply lighter coats of water as needed until we reach batting practice. After each team takes batting practice we steel drag the skinned area and apply another coat of water. On a game day in July we might water the skinned area as many as 6 times during the day, more if the West Texas wind is blowing 30 mph." "Some other aspects of our infield maintenance include rolling the skinned area when the team is on the road as often as possible with a 2-ton vibrating roller. We rent this piece of equipment; otherwise it would be something we did almost every night following a game. In order to keep the high traffic spots tight during home stands we take our Workman and tire roll the base leadoff strips and player position spots. When the team is on the road we do not worry as much about keeping moisture in the skinned area, we water heavy following the last game to “crust” over the skin and prevent blowing dust and then pick it back up two days out from the next homestand." "Every 7 days or so we will reapply calcined or vitrified clay with a top dresser in order to maintain the ¼” layer of conditioner on top of our infield mix. I want my base to be as firm as possible and keep the conditioner layer consistent so that it can be easily groomed and the base mix will retain some moisture. Also, every offseason we will strip about ½” off the top of the skinned area, bring in some bulk mound clay, till that in and have the infield skin laser graded." 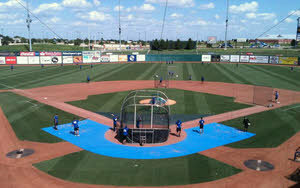 "We use the hose when we have accumulated infield mix into our edges, or when they really need a deep cleaning. We usually shut off our irrigation system booster pump and use a nozzle that produces a fine stream of water to hose material out of the grass. Using the hose method requires some cleanup afterwards to get the smooth transition between grass and skin back. Because of this we usually only hose edges when the team is out of town and we use a backpack blower during home stands. The blower with a constricting nozzle attachment on the end works great for cleaning edges, especially when most of what has migrated into the grass is calcined conditioner." "In order to maintain sharp and smooth transitioning edges we use a spinner type edger, like what is used to edge a sidewalk. We string edges, run the edger along, come behind that with a two sided hoe and clean it all up with a rake. We always do this prior to a homestand and also in the middle of the longer home stands. Periodically during the season we will need to refill some edges with infield mix. During the off season we will re-sod the edges that take the brunt of the wind." Thanks Eric for sharing your comments and expertise on maintaining your professional baseball infield!